This guide will show you how you can manage a team with unlimited money in the Custom Team-mode introduced in PCM2009. The first thing you need is a small program called "ArtMoney". It's a program widely used by game-cheaters - just like us - and I happen to have used it for a lot of my games. After downloading and installing Artmoney, launch both Pro Cycling Manager 2009 and ArtMoney. I'd recommend configuring PCM to run in windowed mode, just to easily switch focus from ArtMoney to PCM, as you are probably gonna do it some times. Also configure PCM to use € (euros) as the game currency as long as you change the budget, as that's what the memory behind PCM uses. Feel free to change the currency to whatever you like after completing the guide. Click next to advance to the team selection-page. Click at the "Custom team" button placed in the right bottom of the screen to create your own team. You will then be sent to the rider-selection page, and we are now gonna use ArtMoney. Click "OK" to begin searching. The program now searches for the value in the game-memory, and returns the found instances. It might take some seconds. When it has finished searching, you will get some adresses (In this example I got seven, but your result may differ. Hope for few results, as it means less work for you), which probably makes no sense to you, but one of those holds the value of your budget. Warning: There's a chance your game might crash during the following instructions. However it is not very likely to do any damage to your game. If it crashes, just launch it again and start this guide all over. Click on the fat green arrow to add the found adresses to our working table. You will now see all the adresses in your working table. Start editing the value of the first one to the budget you would like to have (i.e. 10,000,000 - without the commas). After typing in the value at the first found address, hit enter and maximize up your PCM. 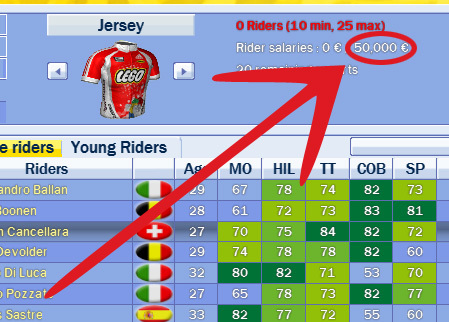 Add or remove a rider from your team, and look, if the maximum budget in the upper right corner changes (not the one before the slash, but the one after). If it does, you've made a hole in one, if it doesn't, minimize PCM again and maximize ArtMoney. Set the first address back to it's original value, and go to the next address. Do the excact same thing , until you've found the right address (remember to add/remove a rider ingame, otherwise the budget won't update in the game). When you've found the right address, you can either choose to close ArtMoney and finish creating your team ingame, or go back to ArtMoney and change the budget in the address, if you've changed your mind during this. Have fun with your career! My McAfee Virus Scanner tells me that it has detected a trojan downloading this. I have searched everywhere to confirm whether or not this is true and many sites say that it is a dangerous virus that could potentially destroy your files and cause you to have to reformat your PC, however many users of this program say it is not a virus. HOW CAN YOU MINIMIZE PCM? AWESOME!! ur a ledgend thanks alot! alt + tab to run in windowed mode. This only useful for one season, after that when the rider want to renew contract, you will have trouble.. Simply because we don't have much money to so.. The max salary allow is only 700k.. but if you take all star team, It can easily cost you more than 1million..
Well, at that time, you can add money to your budget using the advanced editor. @ AaB-ern: I'm using the advanced editor and have increased my sponsor revenues but the max salary stays at 700k? Which table I need to use for it?? does this work with PCM 2010? THANKS for this 10 Million Euros!!!! Does it work with PCM 2012? Cause I tried it, I raised my sponsor money, but my "balance" remained low, so I cannot really do magic! But how can you avoid that next season your payments are higher because now i have a insane team but i noticed that next season the payements are just 700.000. so is there a trick that you can maintain you riders?? @peru: Use a database editor to add money to your team once you have started the game.